Ready for some TGIF-apropos nail news? 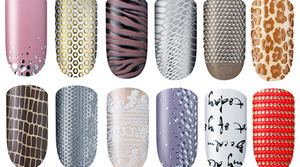 Not one to follow trivial trends, essie is finally getting into the nail wrap game. It’s about time! The talon experts have rolled out Sleek Stick Stickers available in 12 designs ranging from “Don’t Cheetah On Me” (animal print, obvi) to a blinged-out pattern entitled “Glam It On”. Whichever chic turf you inhabit, the nail appliqués provide a high gloss finish that’ll withstand hailing taxis and such, even in the harshest of temps. Nab ’em for a paltry $9.99 per set at Target, darlings, and get ready to be distracted by those digits.